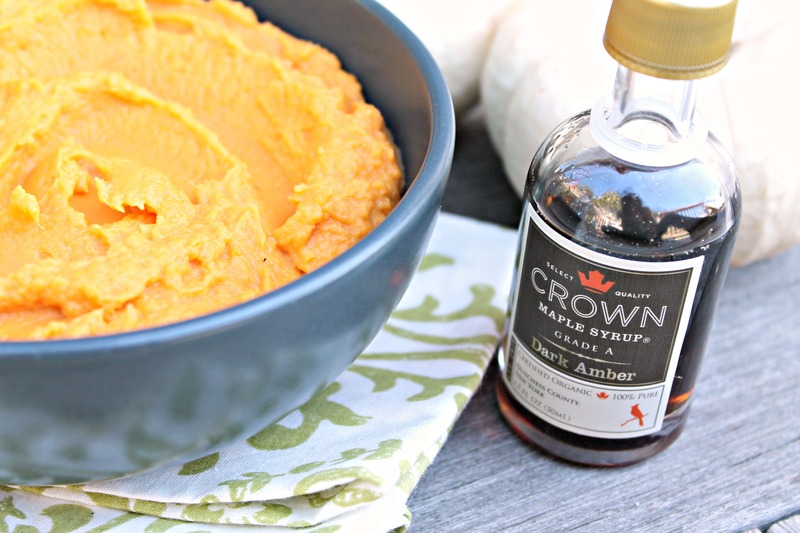 Learn how to make the smoothest sweet potato puree – one which we’ve infused with maple syrup and is the perfect side dish to your holiday table! The amount of sweet potatoes that we consume during the fall is incredible and shocking at times. But why stop the delicious eats when I know sweet potatoes are an excellent source of vitamin A (in the form of beta-carotene). They are also a very good source of vitamin C, manganese, copper, pantothenic acid, and vitamin B6 – basically a powerhouse root vegetable that when made into a silky smooth puree, is just the side dish your dreams are made of. Other recipes include whole grain salads, curry potato soup, and noodles using sweet potatoes! Cook just until tender, drain the water, and bring back to the hot pot. Over low heat, stir the cooked sweet potatoes around. This allows excess water to evaporate! Quickly season with a generous amount of salt – potatoes love salt and taste extra delicious with just the right amount. Using an immersion blender is what has resulted in the smoothest puree in my experience – you can use a food processor which could work just as well. The addition of maple syrup balances out the earthy sweet potatoes, making it a delicious dish! This sweet potato puree is infused with maple syrup and makes for the perfect side dish during the fall and winter seasons! Cut the sweet potatoes into large chunks and cook in heavily salted boiling water until fork-tender. Drain the water and keep the potatoes in the pot. Add the cream and butter, using the immersion blender to purée into a smooth texture. Season with salt and pepper. To serve, drizzle with maple syrup. Serve hot. This recipe first appeared in the Martha’s Vineyard Times, November 2015. I can’t get enough of sweet potatoes and yams- this looks pureed to perfection!